Finally, our first frosts have come and with the yellowing of the leaves signifying an end to our nice summer. Not that many are eagerly awaiting the coming of winter but the fall is very nice unto itself. Thankfully, the frosts have not been severe enough to freeze over any sloughs so many of our water birds are still with us even though a few, like the Blue Winged Teal, have already headed south. We might as well enjoy them while we still can. One of our most widespread "water birds" on the planet is not exactly the kind that one associates with ducks and geese. The Osprey, a member of the hawk family, is dependent on water because its diet consists entirely of fish. Because of this characteristic, to me, it makes it a kind of water bird as it were. 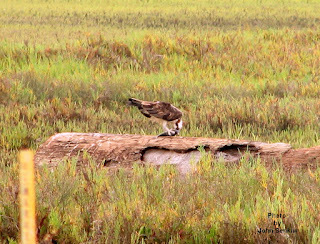 The Osprey is a large hawk just slightly smaller than our eagles. Although there is only one species of Osprey it is found just about throughout the entire planet where there are trees and fish present. It does not exist in places like the Tundra because there are no trees on which to build its nest. Their nests are large bulky affairs made of sticks and twigs built atop large trees near streams and lakes. The Osprey is a pure fisher catching rather large fish that are just under the surface of the water. It does not dive in but drops down on the fish feet first catching the fish crosswise. Often the Osprey will be completely submerged during the process. With powerful wing beats the Osprey rises out of the water and just as it clears the water it turns the fish around in its claws so that the fish is pointing head first in the direction it is flying. This orientation reduces the amount of drag making it easier to fly with the fish. Some twenty years ago two of our children attended summer camp at Crystal Lake near Canora which happened to have an Osprey's nest nearby. Needless to say I spent a considerable amount of time watching the parents bringing fish in for the youngsters to eat. It is too bad that I did not have a camera with me at the time as I could have taken some super pictures of an Osprey flying with a fish. It is fortunate for the Osprey that it does not often take "game fish" like pike and pickerel thus not incurring the enmity of man. Rather, it usually takes suckers and mullets which are considered inferior for human consumption. 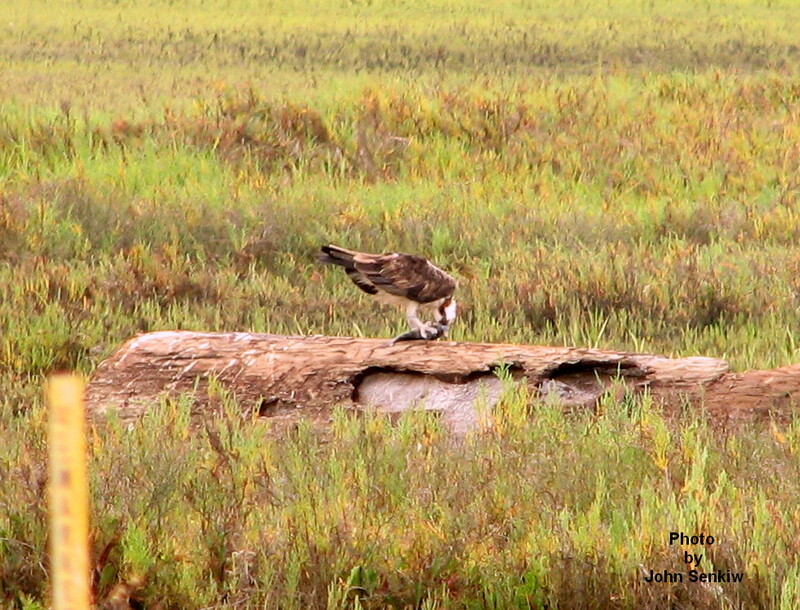 Bald Eagles like to force Ospreys to drop their fish and keep it for themselves. Lazy eagles? Ospreys are quite easy to identify. They are very vocal and constantly make high pitched squealing sounds that do not seem to befit such a majestic bird. In flight their wings are usually bent backwards noticeably making the bird look like a flying W. Whether perched or in flight the Osprey is white headed somewhat resembling a Bald Eagle save for the tail which in the eagle is all white. One other marked difference is the eagle's head is all white while the Osprey's white head has a very prominent black eye line. When perched Ospreys show a slight crest at the back of the head. Males and females are the same. I have occasionally seen an Osprey fly over our house but have never been able to photograph one locally. This week's picture was taken in Carlsbad, CA at the Batiquitos Lagoon. It is eating a freshly caught fish on a pole that was left there specifically for that purpose. This arrangement also provides humans with a good vantage point to observe the bird in iits natural setting. The picture was taken at very long range so it is not as sharp as I would have liked but the field marks are clearly visible.